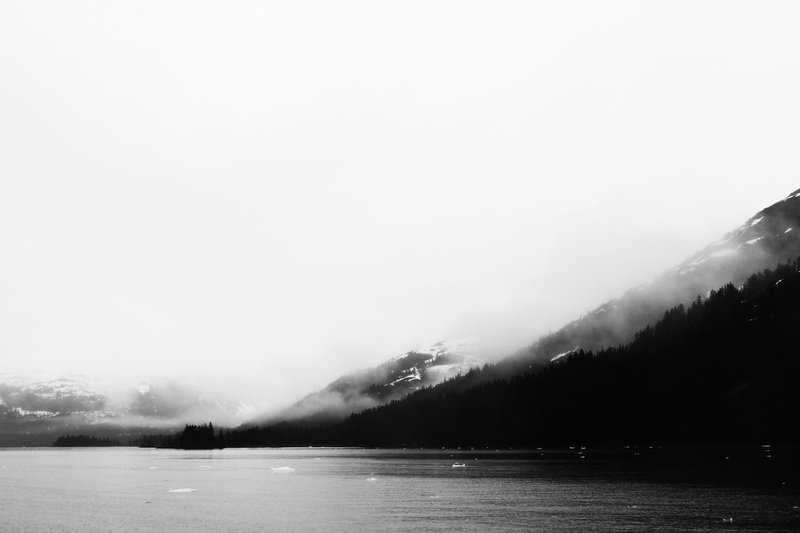 Alaska...what to say about Alaska without writing a novel? Well for starters, it was amazing and I had a wonderful time! Now I realize I'm acting as if I've never been before, which is not true. Scott's immediate family lives up there, so I've had the amazing opportunity to go twice now! I first went in 2009 for Scott's, brother's Wedding. While we did do some brief sightseeing and a quick bit of fishing, the primary focus of the trip was the wedding. So this time the focus shifted to more of a tourist adventure for me! I'll try not to go off into too much detail, but I do want to recap our wonderful trip! Our home-base was Eagle River - about 15 miles northeast of Anchorage, where Scott's parents live. 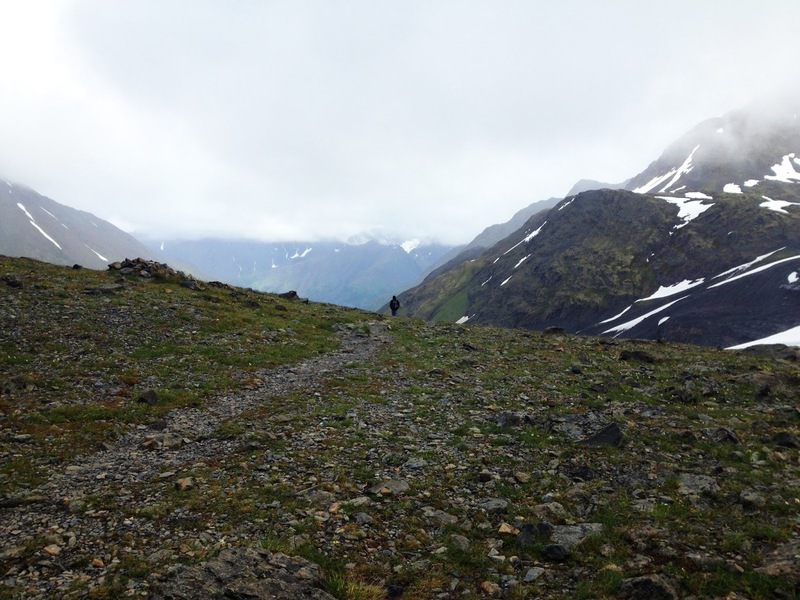 Our adventures took us Southeast past Anchorage and down to Girdwood and Whittier, as well as Northeast into Palmer and surrounding areas. We got in late on Monday night, so we slept in a little on Tuesday morning, and then Scott and I got ready to hike a popular trail - Crow Pass. 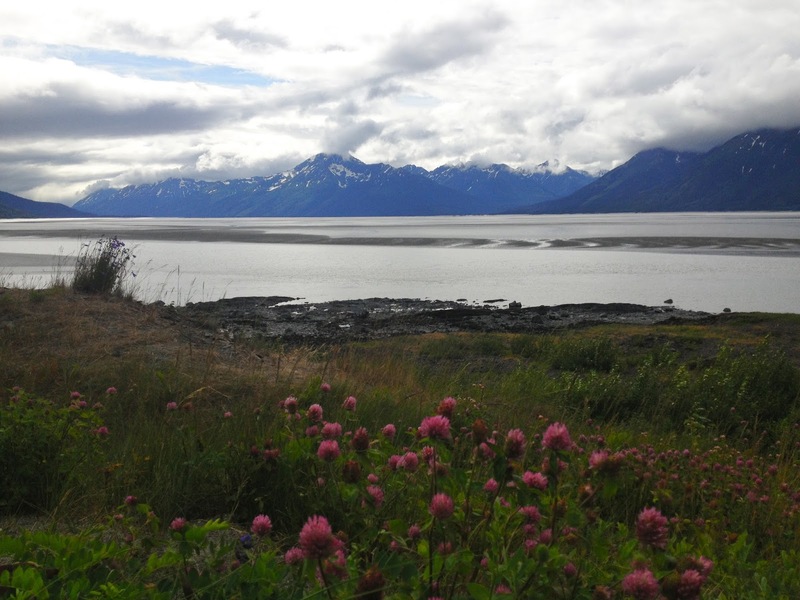 It's about an hour drive to the trail head, by way of the Seward Highway which is a beautiful drive! 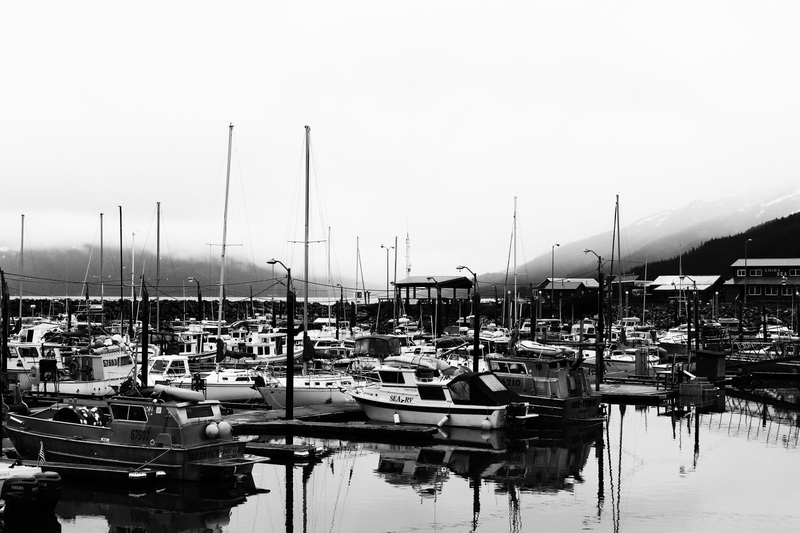 It hugs the coastline until you get to Girdwood and start heading into the mountains. We started hiking at about 11:30am and quickly moved our way up and through the first mile of trees. Shortly thereafter we were, for the most part, above treeline with gorgeous views. 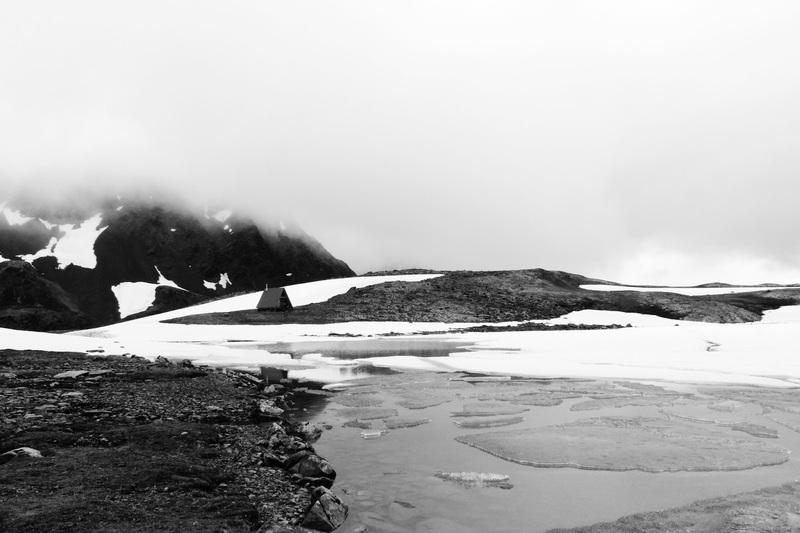 It was a chilly day and the clouds covered a majority of the surrounding mountain peaks - however, in my opinion, this just made it that much cooler! In Colorado, we almost always have sunshine, and I've never seen the clouds cover the mountains like they do in Alaska! It was another mile and a half before we reached the first part of the pass. Right as we made it there, the clouds were really coming in low. Scott took me over to a beautiful, bright blue lake a little ways off the trail, that I wouldn't have even seen if he hadn't known about it! It was so pretty! After I took a million pictures of it, we continued on to the end of the pass, which was about another quarter to half a mile and a little more elevation gain. At about the same time the wind picked up and it was COLD! I was having fun though and the scenery was breathtaking so it wasn't bothering me too much (yet). 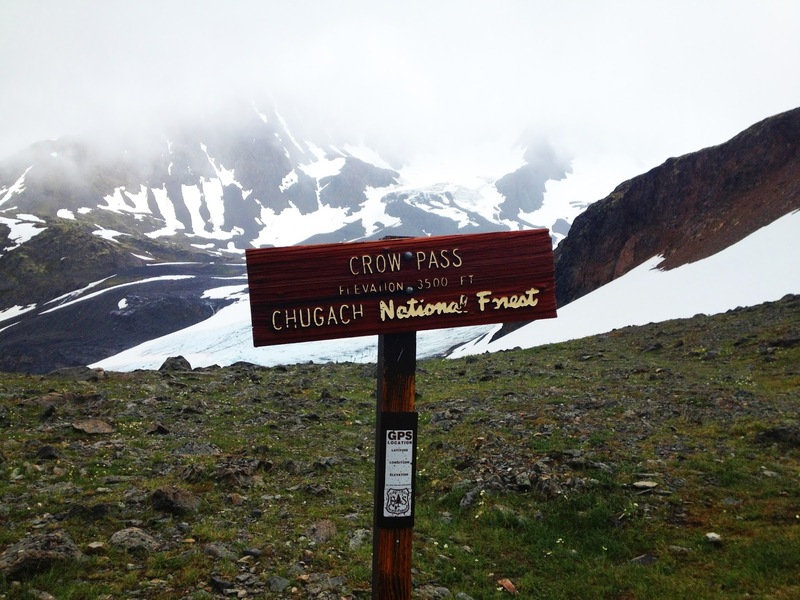 We made it to the end of the pass where you can see Raven Glacier and more incredible views. The trail continues on for about 18 more miles (in fact you can take it all the way back to Eagle River), but we didn't have a ton of time, and were both freezing by this point, so we headed back. One thing that I still can't get over, is the fact that the top of the pass was only 3,500 feet in elevation. Coming from Colorado, where I live at 5,700 feet, this seems so strange to me! Just one of the many differences between here and there! Overall though, it was a beautiful hike and I'm really glad my husband took me on it. On Wednesday, we were scheduled to do a flight tour of Denali - North America's highest Peak at 20,320 feet. Unfortunately Denali has it's own weather system, which was not accommodating to any flights that day, so we made other plans! Scott's Parents took us up to Independence Mine by way of Hatcher's Pass instead. Independence Mine was a large Gold Mine in the early 1900's complete with housing, a dining hall, and even a school for the miners children. Once again the views were phenomenal and it was neat to learn a little about the history of the Alaska gold rush. 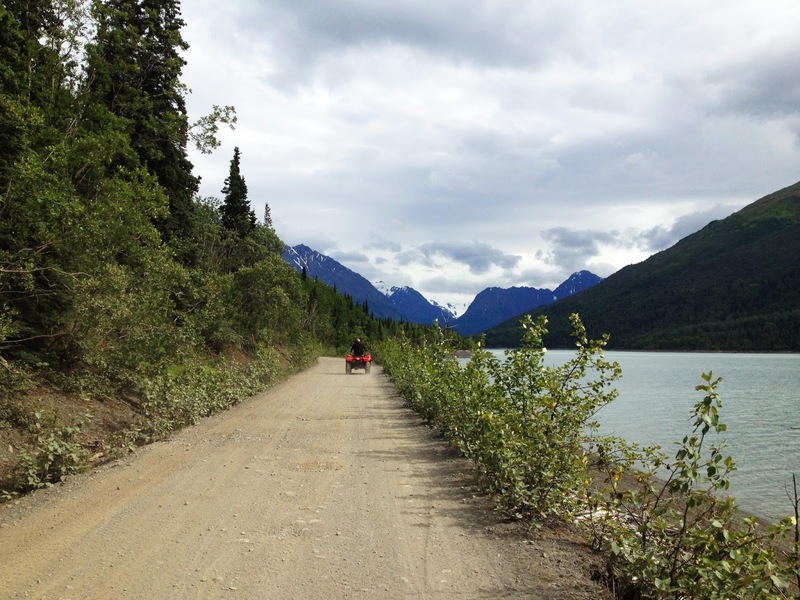 Later that afternoon, we went into Wasilla and picked up our ATV's that we would have through Thursday, and took them out for some test riding at Eklutna Lake. 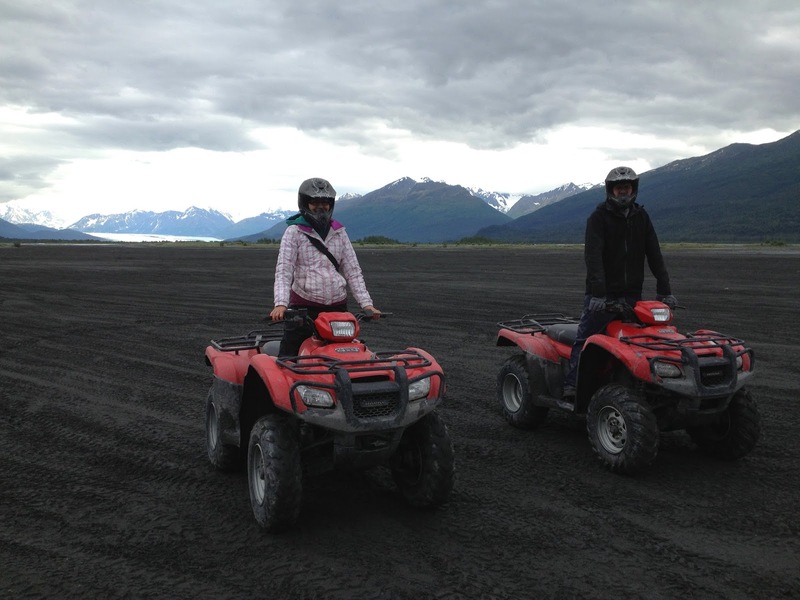 We had two regular, single rider ATV's and one side-by-side ATV. I'm glad we got the side-by-side because it was a lot easier to drive! I did a little practicing on the regular ones, but for the most part I stuck to the two-seater on Wednesday! 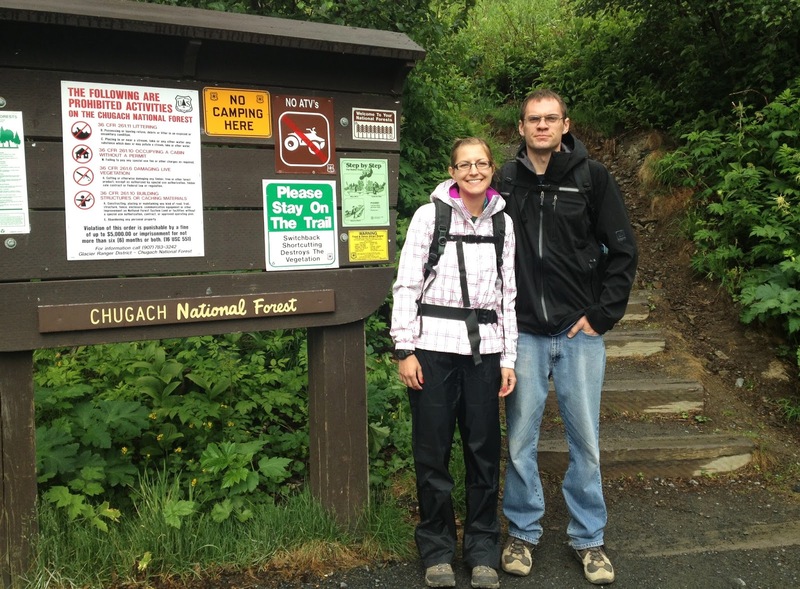 It was a lot of fun - we went about 8 miles one-way around Eklutna Lake to a waterfall. We spent the Fourth of July doing some more ATVing! Scott, his dad, and I drove up to Palmer to pick up Scott's brother and then headed over to our first stop - Sutton. Here there was a very wide, fairly smooth dirt road (good for me), with smaller, more rough roads that broke off from the main road (good for the guys). 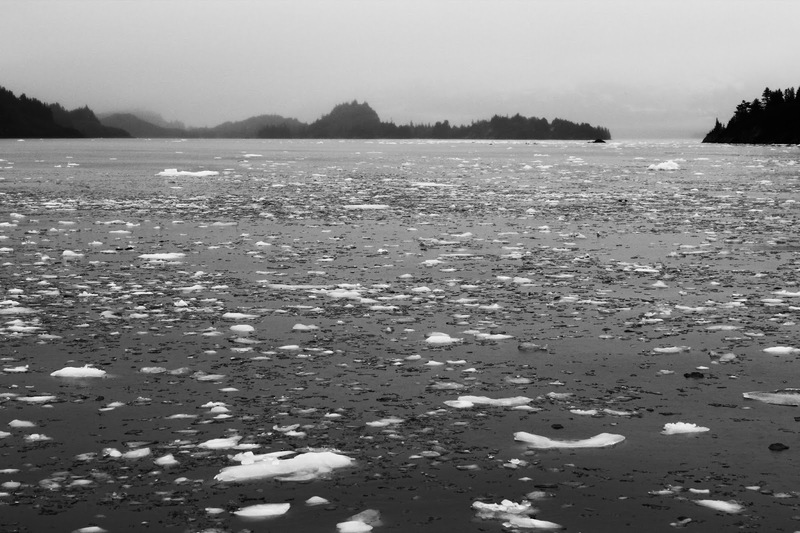 We rode around here for a few hours, then decided to pack up and head over to our second stop - the Knik River. It's hard to compare the two courses, because they were completely different! This area was in a river basin, where we had to make several water crossings - most fairly shallow, but a few got our feet wet! There were some actual "trails", and then some areas that were just completely open to ride around in and have fun. I liked these areas a lot because it was where I could get more comfortable on the single riders! 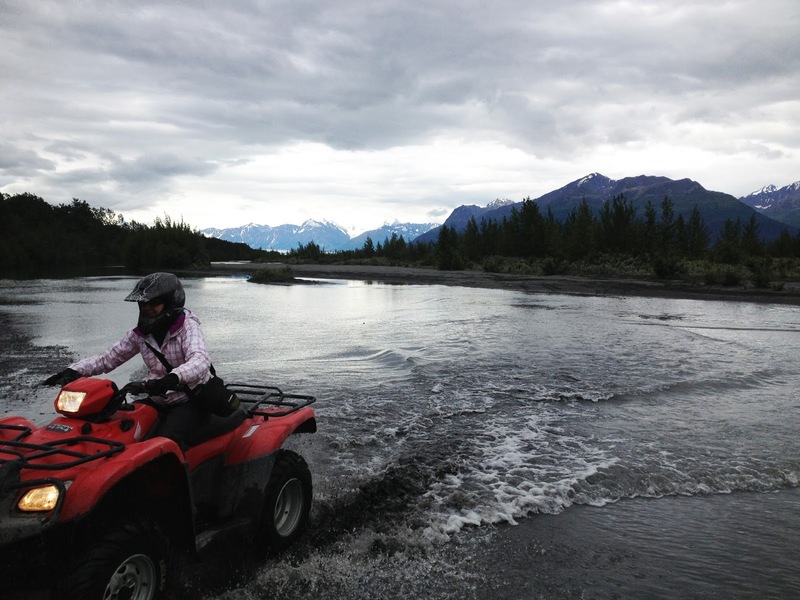 We wrapped up our ATV riding at around 5:00pm and headed back to Scott's parents house for a delicious Alaskan dinner of grilled Chicken, Halibut, and Salmon. Friday we were hoping for another attempt at the Flight Tour of Denali, but once again the weather had a mind of it's own! 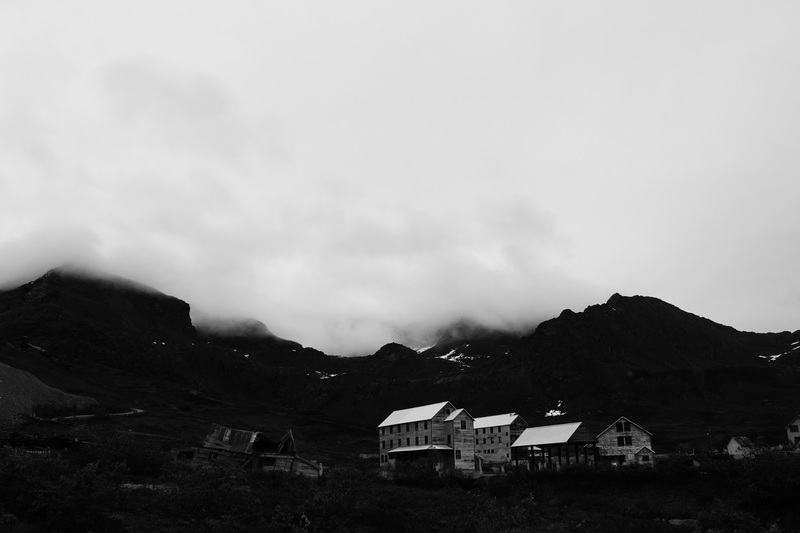 So instead we headed southeast to the fishing town of Whittier for a glacier cruise of Prince William Sound. 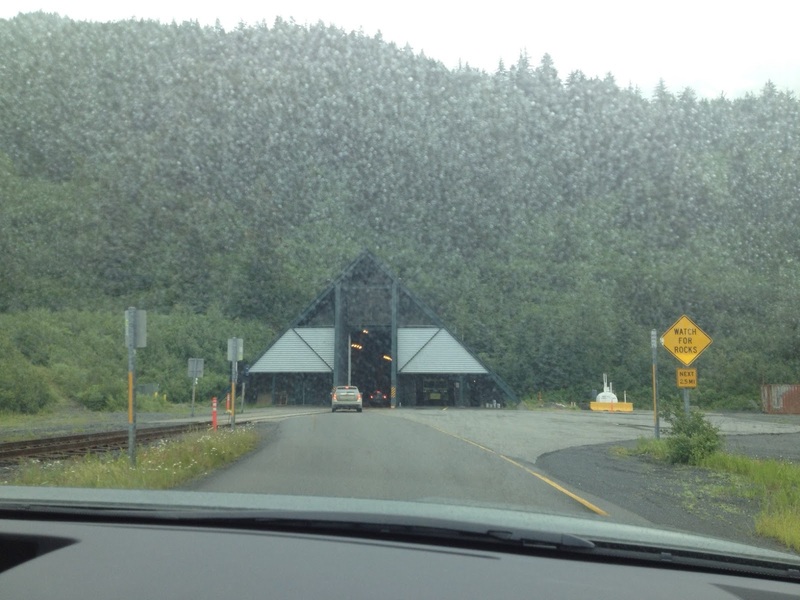 To get to Whittier by land, you have to go through a three mile train tunnel. 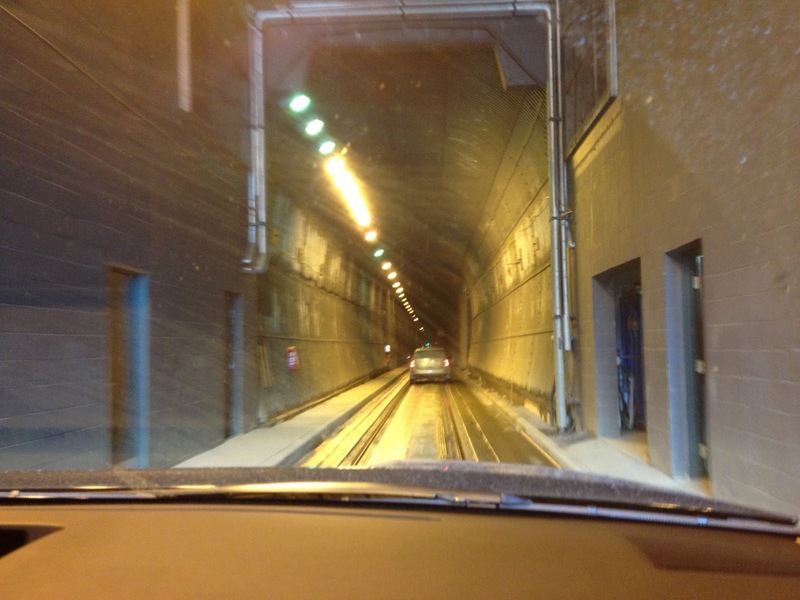 The tunnel only allows for one-lane traffic used by both directions on a schedule, once per hour per direction. If you miss it, you're out of luck...for an hour anyways. Luckily we made it with about 10 minutes to spare, so they line you up and you get to wait! The tunnel is pretty narrow and dark (nothing like Eisenhower here in Colorado), and is several miles long. You drive on the train tracks! Once we made it into Whittier we had a bit of time to spare before our boat launched, so I got a delicious cup of hot cocoa and we walked around the boardwalk. We had Scott's nephews (2&4) with us for the weekend, and I think they enjoyed the boats! Our cruise ship started at around 1:00pm and we had fish and chips for lunch while we made our way out of Whittier and towards some glaciers! We made a few stops on the way for some waterfalls and one for an eagle sighting. Then we finally made it to the Glaciers! They were huge compared to any I'd seen before, and seeing them by sea definitely made it a different experience as well. At one point, the glacier calved making a huge crashing sound and lots of waves. It was really neat to see! We also saw tons of birds (and one area FULL of them - above picture), and some sea lions! We saw a few more glaciers and then headed back into Whittier. By this point I was freezing, so it felt nice to get back into the boat and warm-up! After we made it back, we quickly headed out to make the 5:30 tunnel, briefly popped into the visitors center on the other side, and then stopped in Girdwood for some dinner. Saturday was our last day, and we once again had hopes to go on the flight tour of Denali - but alas, I guess it was just not in the cards for me to see North America's tallest peak this trip (maybe next time!). So, we headed into Anchorage to do a little bit of shopping and lunch at the local Saturday Market. It was fun to walk around the shops, and I even tried a Reindeer Dog for lunch! I also picked up a few souvenirs. 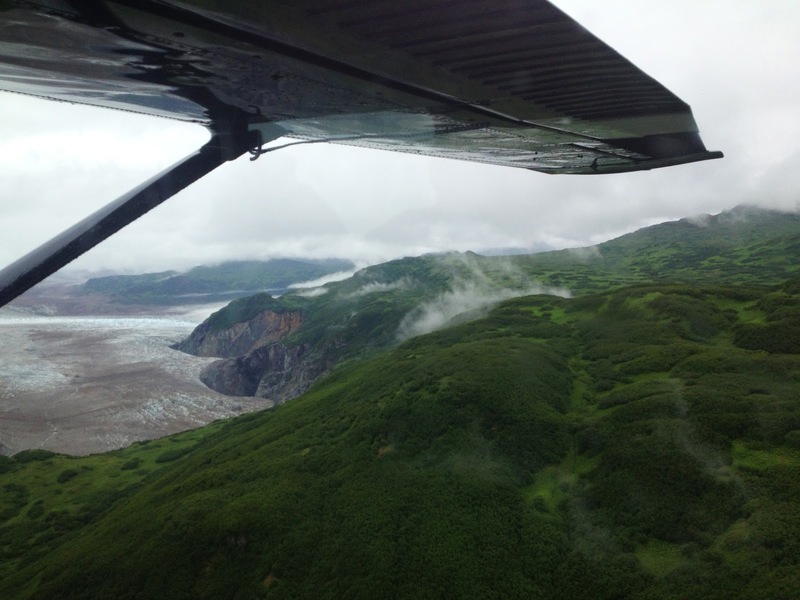 Since we couldn't do a flight tour of Denali, we decided it would be fun to do a flight tour around Mount Susitna to Triumvirate Glacier and Beluga Lake. We rode in a Float Pane, which my first time (it was not nearly as scary as I had imagined, although I would've preferred not to be in the way back). 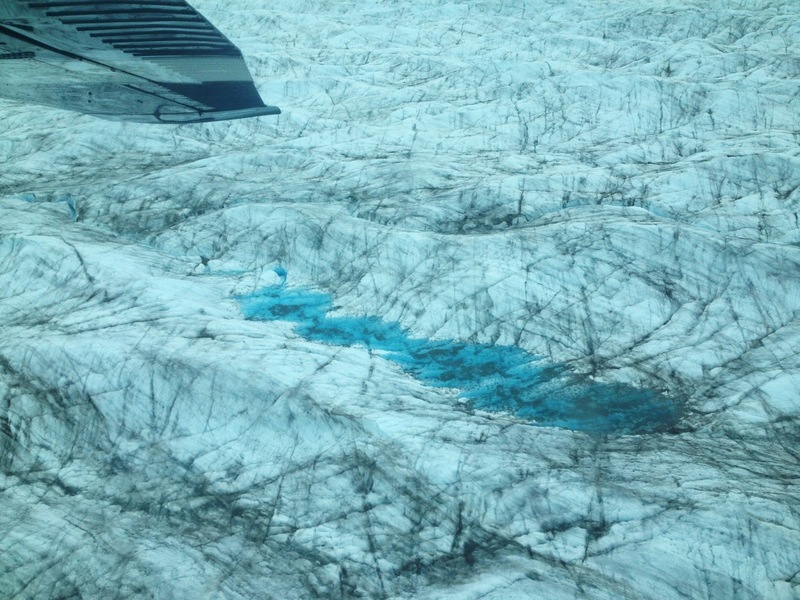 We flew over various terrain from ocean to wetlands (and saw several Moose), to forests, rivers, lakes, and eventually the glacier! I think I'm going to call this my "Glacier Trip" because I saw a LOT of them - but honestly, it didn't get old! This last one was just as cool as the others I'd seen - and the fact that I was viewing it from air, added once again, another dimension! Our pilot circled around it multiple times at multiple angles which made it really neat! After the glacier, the pilot took us over to Beluga lake and we landed for a brief stretch break! It was kind of neat because I think the lake was pretty much in the middle of nowhere - somewhere you'd only get to by a float plane! After our stretch break we loaded back into the plane and headed back towards Anchorage. 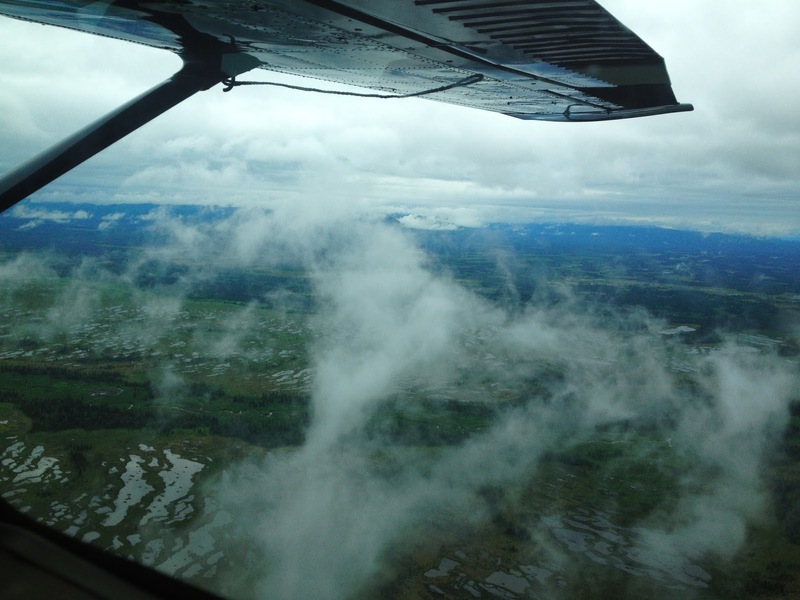 On our way we flew over the delta of the Susitna River where we saw Beluga Wales and more sea lions! Overall it was an awesome trip! 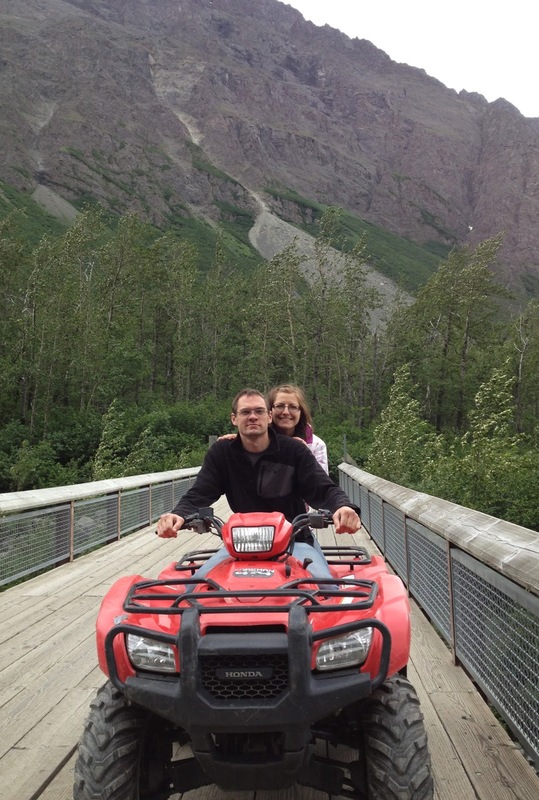 I had a lot of fun exploring Alaska and spending time with my In-Laws. They were great hosts! A big thanks to them for showing me a great time in their beautiful state.